There are some moments in history that make the world totally different, that change our understanding of time into before and after. 9/11 was such an event, not only for the United States but for the entire world. The physical, economic and social dimensions of the attacks on New York and the collapse of the World Trade Center were immense, widespread and prolonged. So too have been the efforts to recover over the past ten years, efforts that are described in this book written by a keen and impartial observer for a general audience. In my experience studying disasters of all kinds, in all regions of the world, it requires a great amount of work to reconstruct what happened in a coherent way. It is indispensable to piece together many individual perspectives — like a collage by the artist David Hockney. This is what Dave Mammen has accomplished in this book. When Dave began to compile his notes he asked me, “Who should I be writing for?” and I answered, “For the governor of Tokyo; for office workers and students; for a housewife taking care of her family; for my mother living in the suburbs.” I do believe he has accomplished this. He explains in detail the role of federal, state and city governments; how individuals and nongovernmental organizations have helped shape recovery; how recovery in New York has been taken as an opportunity to make many improvements, not just rebuild; and how recovery has adapted to new knowledge, for example about health issues that have emerged over time. He explains the many delays, disagreements and unintended consequences of recovery efforts, but also the creativity and leadership that New Yorkers provided. Dave introduces the reader to the institutions and personalities that have created recovery, thereby making the story of New York’s experience over the past ten years a valuable reference for others worldwide. 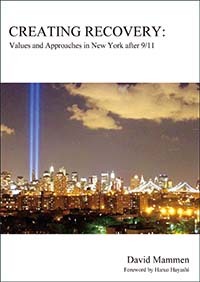 I am pleased to have this book published on the tenth anniversary of 9/11, in both English and Japanese editions, as a concise but thorough account of ten years of recovery efforts. I respect and appreciate Dave Mammen’s patience and commitment to this project as a New Yorker who was a witness to these significant events. David Mammen is a nonprofit executive. Trained as a city planner, he has conducted many research studies concerning urban development and public management in the U.S. and overseas. He was a Fulbright Research Scholar in Japan (1986) and Visiting Professor at Kyoto University (2006-7). His report, Making Tokyo World City, was published in 1989 by the National Institute for Research Advancement. He led two international delegations concerned with recovery and reconstruction in Kobe following the Great Hanshin Awaji Earthquake in 1995. From 1994-2004 he was President of the Institute of Public Administration. He then helped establish The Center for Good Governance, a nonprofit consulting firm, and was Chief Operating Officer of Cross-Cultural Solutions, a nonprofit that sends volunteers overseas. He was Chairman of the International Division of the American Planning Association from 1994-2004 and was elected as a Fellow of the National Academy of Public Administration in 1996. He lives in New York City where he is now Administrator of Rutgers Presbyterian Church.